Now that Captain America: Civil War has hit theaters, directors Anthony Russo and Joe Russo will start prepping their massive two-part adventure Avengers: Infinity War Part I and Avengers: Infinity War - Part II. We have previously reported that production is scheduled to begin at the end of this year, with both movies being shot back-to-back over a massive nine-month stretch. The filmmakers have previously teased that there will be upwards of 67 characters featured in this superhero epic, which will bring Marvel Phase 3 to a close. And it seems the filmmakers have confirmed at least one of these characters, Captain Marvel. The standalone Captain Marvel film is slated to hit theaters on March 8, 2019, just a few months before Avengers: Infinity War - Part II arrives on May 3, 2019. Nicole Perlman (Guardians of the Galaxy) and Meg LeFauve (Inside Out) have been set to write the script, but the studio hasn't announced a cast or director quite yet. Marvel Studios president Kevin Feige recently teased that cast and filmmaker announcements will be made sometime this summer. During an event at the Smithsonian Institute in Washington D.C. yesterday, the directors were discussing Infinity War and mentioned Captain Marvel by name, details which spread throughout Twitter last night from fans in attendance. When a fan asked if they had just confirmed Captain Marvel for Avengers: Infinity War, one of the Russo's said that he really meant "Captain Barvel," which is a "totally different character." The Russo's also joked that Captain Marvel would be in Infinity War, except that she dies at the end of the Captain Marvel movie. One Twitter user noted that this joke was an attempt to "weasel out of confirming" Carol Danvers/Captain Marvel in Infinity War. 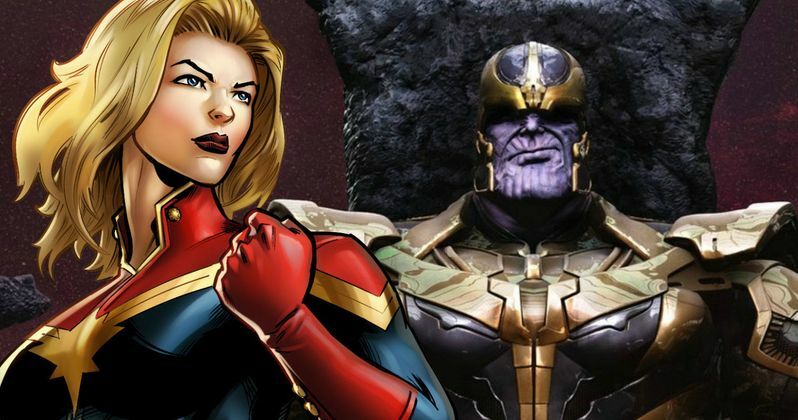 Even if she does die in Captain Marvel, which seems highly unlikely, she could still debut in Avengers: Infinity War - Part I, which hits theaters on May 4, 2018, several months before Captain Marvel debuts in March 2019. Over the past few months, there have been several rumors about various actors being considered, or expressing their interest in the Captain Marvel role, such as UFC fighter/actress Ronda Rousey, Emily Blunt, Katee Sackhoff, Katheryn Winnick, Jessica Chastain and Rebecca Ferguson. There was also a rumor that surfaced last year which indicated that Marvel was eyeing Angelina Jolie to direct Captain Marvel, but that was never confirmed. Surprisingly enough, this character was almost introduced in the MCU much earlier. Shortly before the release of Avengers: Age of Ultron, producer Kevin Feige revealed that Captain Marvel was in an early draft of Joss Whedon's script, but they didn't want to show her as a fully-formed superhero without giving her a proper introduction. We also reported last year that the Marvel/Neflix series Jessica Jones almost introduced Captain Marvel, but that was during an early incarnation of the project, when it was set up at ABC. Take a look at the tweets from last night's Marvel Smithsonian Institute event, and stay tuned for more on Captain Marvel's involvement in Avengers: Infinity War.